Some time back, I agreed to do a cartoon for a guy I knew who was a law enforcement ranger at Fort McHenry in Baltimore. The fort is where I walk most days and many of the rangers there know me pretty well, so it was no surprise when one of them asked for a favor. Almost immediately, though, I had second thoughts. I’m often asked to do a “little cartoon” for some special occasion that turns out to be a time-consuming production, all done for nothing more than a “Thank you,” if that. So, after giving it more thought, I decided that if I could come up with a cartoon that would somehow be pegged to the Ken Burns’ National Parks documentary series that had aired on PBS, I’d do it. My thinking was that if I’m going to go to all that effort as a favor for Ranger Chad, I should at least get a small return — a royalty of sorts — for the effort. Once I had an idea that would fulfill both his needs and mine, I drew it up and uploaded a digital copy to my London distributor (Cartoonstock.com, see sidebar link). I also posted the image on my blog as a part of my Monday series of Gag Cartoons and forgot about it. Hello, this is Chris Darling of Ken Burns’ office, Florentine Films. Ken would love to own the original of the Ranger Chad cartoon to display in his office, and was wondering if you’d be interested in trading the original for a collection of his films. Is this something you might be interested in? 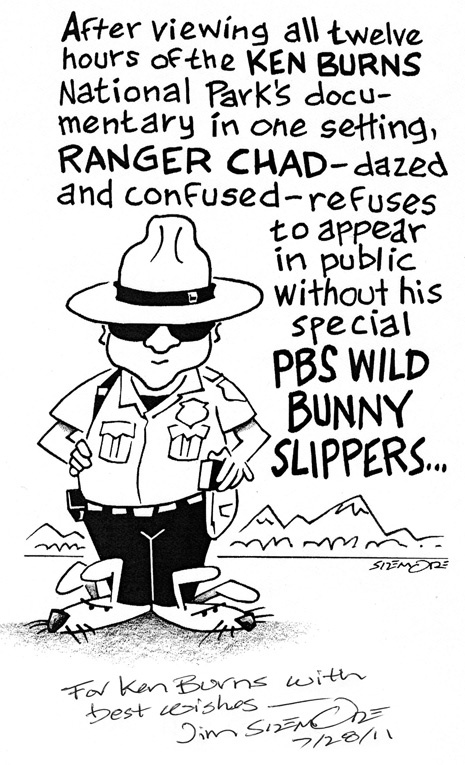 I’m delighted that your boss would like to have the original of the Ranger Chad cartoon and would happily trade for it, except that no “real” original exists — only a digital version completed by me from a rough draft scanned into my computer. However, if Ken would like to have a high resolution digital copy of the finished art, inscribed to him and signed and dated by me, I’d be more than pleased to oblige. Long story short, as red-faced as I was for having made the mistake (“setting” instead of “sitting”), I was at least happy for another chance to get the dedication right. I made the correction, rewrote the dedication, signed the cartoon print and sent it back to Mr. Darling at Florentine Films. A few days later my collection of Ken Burns’ DVDs arrived in a large box via UPS. 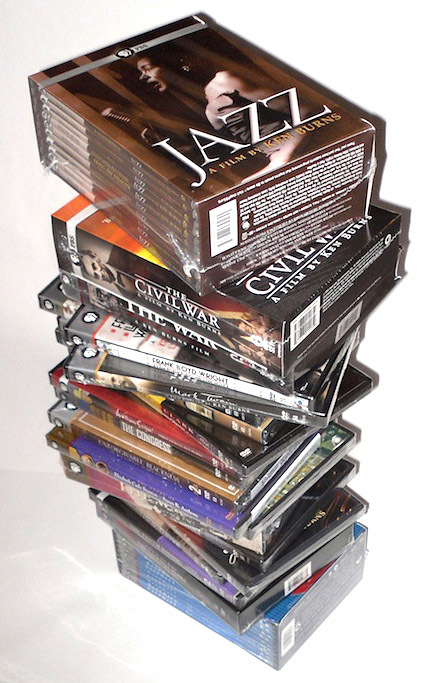 I was impressed with the resulting 21 inch stack (above), which I figured must include every documentary he ever made — except, I noted with dismay, Prohibition. Oh well, I guess it’s all about timing. Prohibition by Ken Burns and Lynn Novik is currently airing on PBS (October 2, 3 and 4). And I’m sure it’ll be repeated many times in most markets. Don’t miss it, it’s really good. This entry was posted on Monday, October 3rd, 2011 at 5:19 am and is filed under cartooning, film, Fort McHenry, gag cartoons, gags, history, movies, non-fiction. You can follow any responses to this entry through the RSS 2.0 feed. You can leave a response, or trackback from your own site. Not to be a wise guy, but as a member in good standing of the Aberrant Apostrophe League, I must point out a second mistake in the Ken Burns cartoon – that apostrophe in “Parks” shouldn’t be there. Sad, very sad — you would think they’d have also spotted that one at Florentine Films. Oh, well, one of these days I’m going to find a proof reader willing to volunteer. So if you know anyone, Dan . . .
Holy Cow!!! I am Ranger Chad!! Jim, I still keep up with your page to see the pictures of Ft McHenry. I miss Baltimore dearly, and currently am working at Jean Lafitte Natl Historical Park and Preserve in New Orleans LA. If I never said thank you, for your time in making me immortal . . . THANK YOU! For what its worth, my mom has the copy you sent me framed and hanging at the house in Memphis. Hey Chad, so great to hear from you. I think about you from time-to-time and wonder where you are and how you’re doing, so this was perfect. (The Internet is wonderful for reconnecting with folks.) I do Miss seeing you on my Fort McHenry rounds — good to know you’re still in a relatively safe job with the NPS. Stay in touch, and if you every need another copy of you cartoon, let me know.